It is long overdue for managers to begin building stronger working relationships with neighboring Tribal groups. With Native issues such as the appropriate management of and access to cultural and sacred sites within wilderness, strong relationships ultimately move us closer to the common goal of managing protected areas for the use and enjoyment of all people! Native peoples are being invited to engage more in wilderness planning and stewardship than previously, and engaging Tribal groups with cultural ties to wilderness is mandated by US federal land managing agencies. However, two questions still remain: Are we truly listening to what they have to say, and are we as wilderness stewards acting on the ancestral knowledge that is being offered from these First Stewards of the land? Native peoples continue to possess the ability to intimately understand and effectually communicate with the natural world and have many things they can teach us all about respectfully interacting with wild places. Tribal chair-man Terry Rambler of the San Carlos Apache Tribe points out: “Many Tribal sacred areas are located on federal lands because these lands were once our ancestral homelands. Tribal connections to these lands have not been extinguished despite changes in title” (Rambler 2013). With increased interest by Indigenous groups to maintain or reaffirm their connections to cultural sites within designated wilderness, the time has never been better to reach out to Native peoples and include them in all aspects of wildlands stewardship. Federal-government to Tribal-government consultations are likely to increase in wilderness planning processes. Therefore, agency planners must prepare to engage in appropriate methodologies that employ place-based and traditional knowledge that provide for sound, adaptive planning efforts (Watson, Stumpff, and Meidinger 2012). The purpose of this article is to offer managers and wilderness advocates field-proven first-step methods and techniques for developing successful working relationships with Indigenous communities that can benefit all peoples and wildland resources. Cross-cultural partnerships are integral to an all-encompassing wilderness system, and strong collaborations between wilderness managers and Native communities can be achieved and maintained using the following proven partnership development strategies. It is important to note that these strategies are not an attempt to speak for Native peoples. On the contrary, these proud Nations, Tribes, Bands, and individuals speak for themselves. Instead, these strategies have been developed from the author’s lifelong experiences with traditional American Indian relatives from the great Ponca Nation (a southern plains Tribe located in north-central Oklahoma, United States), with his Native Intertribal extended relatives, and via his years of practical experience working with Southern African Tribal communities while serving as the US Forest Service’s wilderness training coordinator for Africa. Understanding the group of people one wishes to partner with is a critical first step. Ancestral beliefs and practices, as well as progressive Tribal viewpoints pertaining to protected areas and natural resource management, may differ significantly from that of contemporary viewpoints. By taking the time to better understand a potential partner and how they view wilderness, it is possible to build respectful relations based on common ground and sincerity to collaborate on sensitive issues (Hansen 2007). The following cultural keys are commonly recognized as being present among American Indian cultures, as well as most other Native groups: values, language, family, humor, and connection to the land. These keys are helpful to managers in understanding how contemporary wilderness fits, or does not fit, into the systematic views of Native cultures worldwide. If a manager wants to understand a potential Indigenous partner, they should first understand what is important to that group and what their values are. For example, many Native peoples carry less materi-alistic values than other non-Native cultures. Economic or political gain stemming from activities such as outfitting/guiding or ecotourism in or adjacent to protected areas are viewed very differently from that of mainstream society. What is important to Native people is their ability to provide for their family, that they are free to live as they please in their historical home-lands, and that they are allowed to be spiritual people who can conduct their ceremonies without intrusion or fear of being persecuted for their beliefs and/or ceremonial practices. These values can to a large extent influence decisions and actions made by Tribes during wilderness planning and play an important role in beginning to understand Native cultures. Language is at the center of any culture. It plays an integral role with many Indigenous groups, as many still rely heavily on oral traditions to pass cultural information down through generations. Examples of how language influences culture include Tribal creation stories, histories, songs, and ceremonies that have been passed down through word-of-mouth communication. How can acknowledging Native languages influence wilderness management? Language can effect protected area decisions made collaboratively with Tribal partners in different ways. For instance, cultural sites are not always publicized or highlighted on maps for the general public. This language-influenced characteristic is not only an attempt by Tribal groups to protect the integrity of such sites, it also occurs because this kind of sensitive information has always been maintained and handed down orally through language-based traditions. It may not be realistic to ask managers to learn or study a new language every time they are asked to work with a different Indigenous group. However, since many Tribal stories and ceremonies are place-based within protected areas, taking time to recognize the basic principles of pertinent languages could reveal a particular community’s root-ideals relating to caring for wildlands. This can be key information for a manager or an organization wishing to work in partnership with any Native community. The significance of kinship in Native cultures is helpful in comprehending how Native people interact with one another and with outside groups or individuals such as wilderness managers. Family is one of the most important social and political structures within the Tribal organization. Many Tribes are made up of extended groups of relatives, Bands, or Clans, who in the past traveled and lived together and who still today might live in family clusters on Tribal lands or who maintain family ties across miles. Therefore, understanding how Tribal family structures, such as hereditary leadership, can impact Tribal decision making can lend valuable insight into how best to communicate and work with Indigenous peoples. The role of humor in Native cultures is meaningful when attempting to better understand American Indian people as well as other Native groups. Although humor may not be directly related to the physical stewardship of wilderness, it is important enough to still be considered when working with Indigenous peoples. Significant knowledge directly relating to the management of wild places can be conveyed through humorous remarks and/or circumstances. Native people fully comprehend the fact that life is hard and humor is a means of reducing stress and breaking up the solemn realities of the world around them. Important information on why a certain wilderness decision was made, or how the partnership is progressing may be derived from the briefest humorous words or a seemingly unrelated funny exchange. Fools Crow – one of the most recognized Ceremonial Chiefs of the Teton Sioux shared: “The ancient Native American people lived cooperatively with the land, didn’t waste, didn’t litter or pollute on the scale that we do today. There was no need for them to have an Earth Day as every day was a day of earth preservation for them” (Mails 1991). For traditional Native peoples, this inherited connection to the land that Fools Crow speaks of lives on and is still very much intact. Yet it is this very adoration for the land that can often create difficult philosophical challenges for Tribal peoples concerning the decisions they make or the actions they propose for protected areas. For example, the issue of access to cultural sites within designated wilderness illustrates the pertinence of Native peoples’ connection to the Earth and how this fundamental cultural element severely impacts how they perceive wilderness. Agency managers are held to the law in allowing access to wilderness only by nonmotorized or nonmechanical means. Tribal groups are requesting access to place-specific sites within wilderness they have used for generations. Since a Tribal group has such strong ties to the land and to that place-specific site because of its cul-tural significance, this puts them in a highly sensitive position when working with managers who are bound to uphold protected area regulations. It may not be an easy issue to resolve, but certainly one that both managers and Tribal groups are now trying to come to agreement on more than ever before. Understanding the all-encompassing connection that Native peoples still have with the land is absolutely central to gaining a greater sense of how these communities interact with the contemporary concept of wild places. Developing quality working relationships with Native peoples takes patience and commitment. First, it is imperative for managers to establish trust with the Native community they are communicating with before any level of cooperative work can be achieved. Once a basic trust and a positive rapport has been attained, and respectful communications are occurring, the manager can begin to develop the rudimentary elements of the partnership with community leaders. General partnership goals should be jointly determined early in an effort to make clear both parties’ intentions for the collaboration and to reduce the possibility of unnecessary misunderstandings over the potential long-term relationship. Traditional values, beliefs, and practices should be carefully integrated into the goal setting and overall planning process. It is recommended that managers meet with Tribal elders or leaders in their own home surroundings. This helps build trust with the community by making Tribal leaders feel more comfortable and open to speak freely. Also, having someone from the Tribal community who knows and trusts the agency/organization representative introduce the manager to community leaders can greatly assist in opening up communications more quickly. This community con-tact can also serve as a lingual/cultural interpreter if any type of language or strong cultural barriers exist. Starting communications with a community member will aid in building the necessary trust with leaders, something that will be essential to the long-term success of the relationship. Managers should also accept invitations to visit the Native community, taking every opportunity to attend community activities that are open to the public (e.g., dances, feeds, and celebrations). This may include offers from traditional elders and community leaders to share meals or to speak at Tribal meetings. This sends a positive message that the agency or organization is sincerely interested in learning more about the people and their culture. It can be a positive sign that the manager is beginning to be accepted by the community and can be trusted to keep their word and honor commitments. However, managers should realize that their sincerity and motives could be tested by their ability not to push their ideas or partnership agenda too fast. Pushing too hard or trying to move ahead too quickly to advance a partnership can be strongly frowned on and seen as a typical non-Native self-serving tactic. Each Native group can have unique political structure and relationships. It is important for managers early in the process to avoid getting in between community divisions or becoming involved with Tribal politics. In some instances the official governing body of a community may not completely represent the philosophies, beliefs, or wishes of all community members. An example of this is a community that hosts a Tribal Council made up of primarily progressive or contemporary-thinking leaders, as compared to a more traditionally oriented governing body. Managers and planners should devote time to investigating which leaders legally and traditionally speak for the entire community, and again avoid getting involved in cultural divisions or Tribal political groups. While some community members might open up to the agency representative quicker than others, some members may never be completely comfortable with a particular collaboration or effort. Therefore, managers need to be open to receptive and approachable leaders while not purposely avoiding individuals who are resistant. They must try and work with the leaders who best represent the entire community and who are willing to develop a strong, positive partnership. inventory with Mesa Ranger District wilderness ranger. After partnership goals and objectives have been agreed on, one of the final first steps is to create a partnership work plan. Development of an organized, attainable, collaborative work plan is a significant action toward sustaining meaningful and lasting relationships with Native peoples. All work plan components must balance the cultural elements of the Tribal group and management objectives of the affiliated agency or organizations (Figure 1). A work plan should include partnership goals and objectives, individual on-the-ground work action items, time frames for completing action items, parties responsible for implementing the work, a plan for regular meetings between parties, and a budget. These work plans should be incorporated into formal memorandums of understanding, memorandums of agreement, or cooperative agreements signed by both partners. It is recommended that both Tribal representatives and agency representatives have the authority to sign and fulfill agreements. The efforts given to creating a strong work plan give the best opportunity for positive outcomes from the partnership and collaboration. Executive director of the Northern Arapahoe/Shoshone Wind River Indian Community’s Environmental Quality Commission, Don Aragon, states: “The World Wilderness Congress has always operated on the principle that Indigenous knowledge and perspectives must be included in any wilderness discussion to ensure a full understanding of the wilderness concept” (Aragon 2007). The World Wilderness Congress has therefore formally recognized that Indigenous peoples instinctively and through their own methodologies understand our natural world and must be included in the overall planning and stewardship of protected areas. Recently, on October 15, 2015, more than two dozen Tribes formally requested President Barack Obama to declare the 1.9 million acre (approx. 809,000 ha) Bears Ears sacred site (between Utah and Arizona, United States) as a national monument. Under a unique plan involving nation-to-nation collaboration, it may be the first truly collaborative land management effort between Native Americans and the US federal government (Indian Country Today 2015). The Sierra Club and other prominent non-government organizations have pledged their support to the Bears Ears movement, setting a high bar for further environmental collaboration between the US federal government and Native peoples (Figure 2). 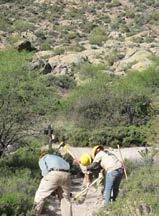 Figure 2 – Trail maintenance and reconstruction in the Superstition Wilderness by Native Corps members. By making sincere efforts to better understand Native groups and their respective wilderness values, protected area managers and planners can build trusting relationships. They can be inspired by Native wisdom to look for ways to combine our passion for the land and our con-temporary knowledge of managing wild places with our Native peoples’ ancestral devotion and knowledge of all things natural. The time is now to embrace such guidance by reaching out to our neighboring Native communities in sincere and respectful ways to engage them in public land planning and stewardship – an endeavor that ultimately will result in a restored life-balance that all peoples can accept and value. GREGORY HANSEN (Ponca) is retired from the USFS office in Washington, D.C., served for more than 10 years as the Tonto NF Tribal relations coordinator, served on the USFS’s SW Region American Indian Advisory Council, and has developed/taught American Indian studies in Native communities and at community colleges and for Native museums throughout Indian country. He currently is the Tribal relations coordinator for the Arizona Conservation Corps – Southern Region, where he developed and manages their Native Youth Conservation Corps program. Gregory is honored to serve as a wilderness management, conservation education, and Indigenous cultures consultant, writer, and instructor for the Arthur Carhart National Wilderness Training Center, in Washington D.C., United States; email: redroadone@aol.com. Aragon, D. 2007. The Wind River Indian Tribes. International Journal of Wilderness 13(2): 14–17. Hansen, G. 2007. Agency employee online training, issues toolbox, Tribal wilderness management. Arthur Carhart National Wilderness Training Center, retrieved from http://www.wilderness.net/statetribe. Indian Country Today. October 2015. Online news, retrieved from http://indiancoutnry-todaymedianetwork.com. Mails, T. E. 1991. Fools Crow – Wisdom and Power. Tulsa, OK: Council Oaks Books. Rambler, T. 2013.Congressional Oversight Hearing Testimony, S. 339, Southeast Arizona Land Exchange and Conservation Act of 2013. Watson, A., L. M. Stumpff, and J. Meidinger. 2012. Traditional wisdom and climate change. International Journal of Wilderness 18(2): 21–25.